Oh! My! My! 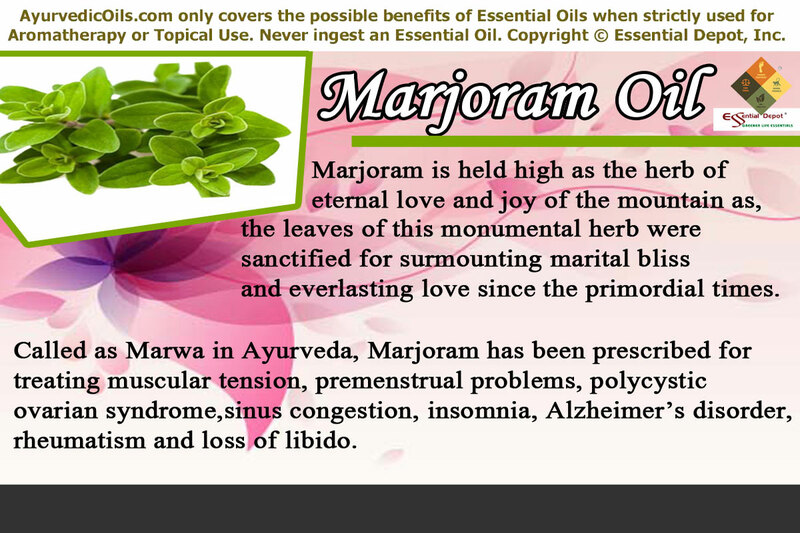 Marjoram is addressed as the herb of eternal love and joy of the mountain. As the most loved herb by Aphrodite, the Goddess of love and beauty, the leaves of Marjoram were sanctified for surmounting marital bliss and everlasting love. The spicy, rich, sweet, soothing and tantalizing aroma of this oil will leave you relaxed, energized and absolutely rejuvenated. Chemical constituents and remedial properties of Marjoram oil: The major chemical constituents responsible for the therapeutic values of Marjoram oil are linalool, a-pinene, cineole and sabinene. The remedial properties of the oil of Marjoram are deodorant, antiseptic, analgesic, disinfectant, emmenagogue, sedative, antispasmodic, calming, anti-inflammatory, antimicrobial, aphrodisiac, antifungal, antioxidant, disinfectant, antibacterial, diaphoretic and expectorant. As a member of the mint family, Lamiaceae, Marjoram has various botanical names and the most common being Origanum marjorana (Sweet Marjoram), Thymus mastichina (Spanish Marjoram), Origanum onites (Pot Marjoram) and Origanum heracleoticum (Winter Marjoram) and few other names. Indigenous to Southern Europe, Marjoram is used as a flavoring ingredient and as a condiment. It is used in various food varieties including salamis, stews, seasonings, marinades, dressings, salads, roasted meat, sausages and goes well with green and leafy vegetables. Marjoram has been an interesting part of wedding rituals, where the Newly-wed couples wear Marjoram wreaths as a sign of beginning their magical love life. Marjoram teas and infusions are extremely famous for their power in relieving headache, sinusitis, flatulence, hay fever and menstrual discomforts. It is an ancient belief that if a Marjoram plant grows on a grave, and then the deceased person has attained perpetual happiness in the world after. The aromatic leaves and flowers of this plant were strewn in homes for its antimicrobial, disinfectant and deodorant properties. Traditional home remedies with Marjoram include poultices for healing boils, rashes, sprains and abrasions. Folklore beliefs also include the use of Marjoram as a rescuer from bad luck and curses. Ayurveda is a holistic healing science that treats human beings as reverential individuals and not just as patients. This miraculous therapy respects the individual differences of every person and recommends remedies as per the unique individual constitution and not on the basis of diseases. It is for this reason, the first Ayurvedic consultation always begins with personal discussion with the Ayurvedic professional for learning the medical history, family background, lifestyle, food habits, likes and dislikes, good and bad things that have happened in the life of the person, affecting and influencing his medical condition. Ayurveda strongly states that health is a tree-tier figure that encompasses physical, mental and spiritual well-being. “The aim of Ayurvedic medicine is to integrate and balance the body, mind, and spirit. This is believed to help prevent illness and promote wellness” quotes the National Institute of Health. Even today, the world of medicine looks up to Ayurvedic healing for its integral health-giving methodologies that strive to cast a person through all the facets of life together with the wellness of the mind, body and spirit. By identifying the root cause of a disease, Ayurveda hits the nail on the head of the illness without missing its aim, as shooting the bird’s eye. This ancient methodology states that the treatment of symptoms of an illness will grant only a temporary remedy, instead treating the underlying root cause will cure the illness, protect the system from its other side effects and also aid in preventing it in the future as well. The most valued Ayurvedic encyclopedias including Charaka Samhita, Sushruta Samhita and Ashtanga Hridaya Samhita say that everything in the universe are crafted with the five fundamental elements of nature i.e. water, fire, earth, air and space. Every person is unique with a distinct Prakriti otherwise known as the individual constitution (combination of 3 doshas). These doshas are biological energies and are an array of the five vital forces of nature. Vata is an arrangement of air and space and is responsible for the functions of the nervous, respiratory and circulatory systems. Pitta dosha is a demonstration of fire and water and takes control of metabolism, body temperature and cognitive functions. Kapha dosha symbolizes water and earth and it regulates the movement of fluids in the body, physique, reproductive functions and enhanced nourishment. Every individual has a predominance of any one of these doshas, which determines their distinctiveness, personality and behavioral attributes. Absolute balance between these doshas as per the law of nature depicts health and harmony, whereas imbalance due to irregular food habits, code of conduct, sedentary lifestyle, lack of physical and psychological exercises and change in weather conditions leads to ill-health. Ayurveda prescribes natural medications including herbal remedies, Ayurvedic essential oils, Dinacharya or the Ayurvedic routine, prayers and meditation for the spirit and soul, yoga, simple physical exercises, Abhyanga or Ayurvedic massage, Panchakarma (treatment for cleansing toxic remains) and many more for the mind and body. These remedies depend upon the Prakriti of an individual and are always person-specific and not disease-specific. Marjoram and its essential oil are recommended for pacifying kapha and vata conditions, in surplus and to augment pitta dosha. The essential oil of Marjoram has enormous benefits to the body ranging from its efficiency in lessening the risk of hypertension with its anti-depressant property, reducing blood pressure in case of high BP with its effect to check anxiety and stress, checking the amassing of cholesterol with its detoxifying attribute and enhanced blood circulation with its power to pacify vata dosha. Relieves pain and muscular tension: Anyone can clearly pinpoint Marjoram essential oil for relaxing tensed muscles, especially after workouts or physical exertion. With its mild sedative, analgesic and antispasmodic properties, Marjoram essential oil relieves pain in the muscles and joints. Research reports state that Marjoram has the potent to enhance bone mass building by supporting osteotrophic actions in the bones. This is mainly due to the fact that Marjoram is one among the richest source of vitamin K.
With its power to eliminate fluid retention, toxic substances, salts, fat deposits and uric acid in the system, Marjoram is a proven remedy for treating edema, rheumatic and arthritic conditions where inflammation, redness, pain, soreness and swelling of joints are witnessed. Massaging the affected parts with 5 drops of Marjoram oil along with 3 drops of Cedarwood oil with 2 ounce of coconut oil can assist in relieving pain, swelling, muscular soreness, lumbago, joint aches and other associated discomforts by discarding excess toxins in the form of sweat and urine. Checks asthma, cold and other respiratory infections: Asthma, cold, sinusitis, congestion and similar respiratory infections generally occur due to the invasion of bacteria, virus and other harmful micro-organisms. As a potent expectorant, antimicrobial, antiviral and antibacterial agent along with its power to pacify excess kapha energy responsible for the buildup of phlegm and mucous deposits in the nasal and respiratory passage, Marjoram essential oil is effective in treating various respiratory conditions. 3 drops of Marjoram oil with 2 drops of Eucalyptus oil added to steam inhalation and in your vaporizing ointment, massaged gently on throat, back, chest and temples can help in loosening mucous and phlegm, relieve chest and nasal congestion, alleviate headache related to sinusitis and migraine, treat flu, sore throat and other respiratory problems. Encourages menses and relieves dysmennorhea: Marjoram has circulatory, sedative, relaxant and emmenagogue properties that help in regulating the menstrual cycle in case of missed periods or delayed menstruation, reduce menstrual pain and fortify the pelvic muscles. Massaging the lower abdomen, lower back and thighs with 5 drops of Marjoram oil, 5 drops of Thyme oil and 4 ounce of Sesame oil can aid in stimulating regular menstruation, lessen pain, fatigue and anxiety associated with periods and check polycystic ovarian syndrome with its power to reinstate hormonal balances and considerably decrease the level of adrenal androgens. Marjoram essential oil has antimicrobial, antifungal, antiseptic and disinfectant properties that make it an effective oil in healing wounds, rashes, dermatitis, scalp infections, invasion of microbes causing skin infections and acne. Recent studies have established the high concentration of linalool component in Marjoram oil, which contributes to the anti-inflammatory, antiseptic and antifungal properties, thus making it as a significant oil in various cosmetics and skin care products. Blend 2 drops of Marjoram oil with 1 drop of Rosemary oil, 1 drop of Ylang Ylang oil and 1 drop of Orange oil and mix it with your mild skin care lotion or cream and lightly dab it on the affected areas for treating acne, dermatitis, sunburn, shaving irritation, wounds (for fighting against micro-organisms like Staphylococcus bacteria, which worsens infections in case of wounds or other skin problems) and wrinkles. You can also mix this blend in your bath for treating inflamed scalp conditions and for refreshing your skin health. Marjoram essential oil has carminative properties with its ability to enhance pitta dosha, which is responsible for digestive fire and metabolic functions. Massaging the abdomen with 3 drops of Marjoram oil, 3 drops of Nutmeg oil and 1 drop of Spearmint oil with 3 ounce of coconut oil can support in stimulating the salivary glands, augmenting the secretion of bile, digestive enzymes and other gastric juices. This is turn aids in enhancing the appetite, treating flatulence, diarrhea, nausea, abdominal spasms, constipation and also in soothing the intestinal and lining of the stomach. Since the prehistoric times, Marjoram is trusted to be the herb of happiness and love. You will be amazed if I say that this ‘Joy of the mountain’ was adored for its ability to tone down distress and misery. Everything from nervous tension, anxiety, depressed thoughts, negative feelings, loneliness, lack of concentration, stress, mood fluctuations and anger to inferiority complex, has a time to rest with the kind of emotional benefits owned by Marjoram oil. Practicing Pranayama with 2 drops of Marjoram oil with 2 drops of Rosemary oil and 2 drops of Tangerine oil in a diffuser, can help you significantly in relieving stress, anger, anxiety, hatred thoughts, vengeance, inferior feelings and lower self esteem. Pranayama is the Ayurvedic art of balanced breath where the therapeutic properties of these essential oils reach the limbic system of the brain through the aromatic molecules during conscious inhalation of breath or the life force. This renovates the mind and repairs toxicity of the mind and body. In a much similar way, the toxic remains and de-motivating feelings are discarded from the system during extended exhalation. Following this balanced breathing technique daily with the use of Marjoram oil is an excellent way to inculcate optimistic feelings, self-love, self-acceptance, improved concentration, mental dynamism, enhanced memory power and assisting in the treatment of Alzheimer’s disease. This is an effective remedy for protecting the brain from neuronal damages. Marjoram is a representation of tranquility, harmony, health and heartiness. It enlightens the soul by awakening the sense of self-consciousness, especially when using it during meditation. 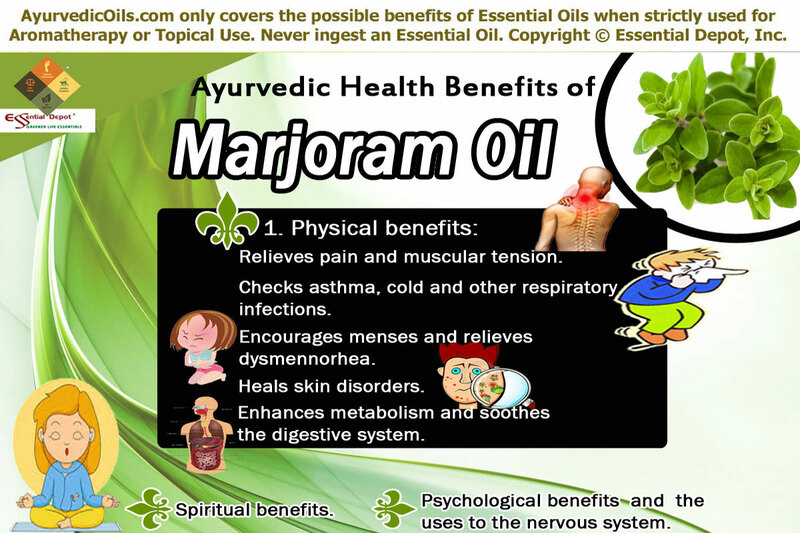 The oil of Marjoram has a positive effect on the heart chakra and the solar plexus chakras, where chakras are the centers of energy in the subtle body. The heart chakra or Anagatha determines one’s ability to love and the emotional factors associated with it are self-love, love for others, inner peace and joy. Solar plexus chakra or Manipuraga decides a person’s level of confidence and the potent to take control of one’s live. Emotional attributes related with this chakra are self-confidence and self-esteem. Adding 2 drops of Marjoram oil and 2 drops of Vetiver oil added to your burner or diffuser at the time of meditation and prayers can open your eye of consciousness, empower your spirit, foster mental clarity, augment self-love paving way for higher self-esteem and improved self-confidence. What next? A peaceful life with joy and focused living is in store for you to enjoy and enrich. Marjoram is also used in the treatment of impotence, loss of libido, bruises, cough, bloating and toothache. This article is only for educational purposes and is not intended to treat any medical condition or to substitute any prescription drugs or professional medical advice. We are not healthcare experts and this article aims only in sharing the healing wisdom of Ayurveda, the mother of all healing sciences on earth. Essential oils are not meant for ingestion. Pure and organic essential oils are highly concentrated liquids and may harm the skin if used directly without dilution. Always remember to dilute essential oils in suitable carrier oils before safe topical application. Speak with your Ayurvedic expert or healthcare professional for deciding on the appropriate essential oils for your unique individual constitution or state of health. Please avoid Marjoram oil if you are pregnant or nursing. Keep away from children. This entry was posted in Essential Oils - Learn About and Purchase and tagged Ayurveda for PCOS, Ayurvedic oils for Alzheimer's disease, Ayurvedic oils for asthma, Ayurvedic oils for depression, Ayurvedic oils for digestive problems, Ayurvedic oils for joint pain, Ayurvedic oils for menstrual problems, Ayurvedic oils for muscular pain, Ayurvedic oils for polycystic ovarian syndrome, Ayurvedic oils for rheumatism, Ayurvedic oils for self esteem, Ayurvedic oils for self-confidence, Ayurvedic oils for stress, Ayurvedic oils for wounds, Ayurvedic uses of Marjoram oil, Chemical constituents of Marjoram oil, Health benefits of Marjoram oil, Marjoram benefits, Marjoram in Ayurveda, Origanum marjorana, Spanish Marjoram, Sweet Marjoram, Therapeutic properties of Marjoram oil, Thymus Mastichina by AyurvedicOils. Bookmark the permalink.